TORONTO, Ontario, Canada, March 29, 2010 (ENS) – The topmost peak of Ontario’s most outstanding geologic feature, the Niagara Escarpment, is under threat from two proposed quarries. But now the quarriers must deal with the massed opposition of a national nonprofit organization, a provincial regulatory agency and two local community groups. One quarry, by Walker Aggregates Inc., is proposed for Duntroon, Ontario a tiny hamlet near Collingwood, while plans for another quarry only 600 meters away were announced earlier this month by M.A.Q. Aggregates. “Clearly, there is no coordination or assessment of the cumulative effects of these two proposed quarries. The Duntroon Quarry license application itself is a serious test case for protecting the Niagara Escarpment, the Greenbelt and Ontario’s freshwater resources,” said Dr. Rick Smith, executive director of the national NGO Environmental Defence. “Taken together, these two proposed quarries could cause significant environmental damage,” Smith warned. 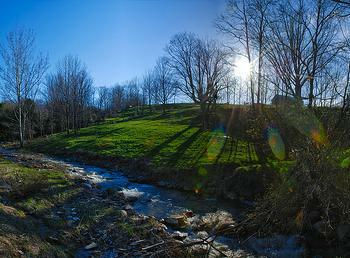 The Niagara Escarpment is one of only 15 UNESCO World Biosphere Reserves in Canada, designated for its unique landform characteristics and the presence of a provincial land use plan to guide development in its area. The massive ridge of fossil-rich sedimentary rock began its formation 450 million years ago. The Escarpment soars 544 meters, (1,785 feet) at its highest point and stretches 725 kilometers (450 miles) across Ontario from Niagara to Tobermory. To fight approval of the two quarry proposals, the national nonprofit group Environmental Defence is joining forces with the Niagara Escarpment Commission, the Clearview Community Coalition and the organization Protecting Escarpment Rural Land. They maintain that the cumulative environmental impact of the two quarries has not been adequately evaluated. Walker Industries already has been quarrying the Duntroon section of the escarpment since 1968 and is now proposing to quarry for another 14 to 29 years and to more than double the current annual rate of extraction to 2.5 million tonnes. Walker extracts limestone to supply the local asphalt, concrete, and road construction industry. The company says its rehabilitation plan involves sloping the walls with overburden and allowing the quarry to fill with water for recreational and natural activities. The quarry expansion requires permits or approvals from a number of bodies, including the County of Simcoe, Township of Clearview , local conservation authorities, the Niagara Escarpment Commission, the Ministry of Natural Resources and the Ministry of the Environment. Walker Aggregates’ proposal is scheduled for a joint Ontario Municipal Board and Environmental Review Tribunal hearing starting on April 12. Yet without consulting residents, the conservation advocates say a settlement has been negotiated between Walker Aggregates, Simcoe County and Clearview Township which, in part, transfers a portion of a county road from Simcoe County to Clearview Township for future closure. This agreement was approved behind closed doors by Clearview Township on February 10, then discussed again in private and approved by Simcoe County Council on February 25. As a result, Simcoe County and Clearview Township are now in favor of Walker Aggregates’ quarry proposal, the conservation groups say. “The agreements between Walker Aggregates Inc. and the municipalities of Clearview and Simcoe have done little to reduce community impacts and nothing to reduce the impacts on the Niagara Escarpment,” said Janet Gillham, president of the Clearview Community Coalition. A local resident, she is outraged by the negative impacts to local communities and by the prospect of continued destruction of the Niagara Escarpment. She has the backing of the Ontario Greenbelt Alliance, a coalition of more than 80 environmental, health and community groups of which the Clearview Community Coalition is a member. The site of the Walker Aggregates’ application is located just steps away from the highest point of the Niagara Escarpment, an unnamed peak in Simcoe County. Protection of endangered butternut trees and a world-class colony of American Hart’s Tongue Fern would be left to a strategy called “isolation,” and the groups say experts are sceptical that this strategy would work. The colony of Hart’s Tongue Fern under threat is believed to be greater in number than the sum of all colonies outside of Canada. “The Walker quarry proposal and Niagara Escarpment Plan re-designation application has been revised more times than we can count, yet the current designation on the site hasn’t been updated since the Trudeau years,” said David Donnelly, legal counsel to Environmental Defence and Clearview Community Coalition. The newly announced 30 million tonne M.A.Q. 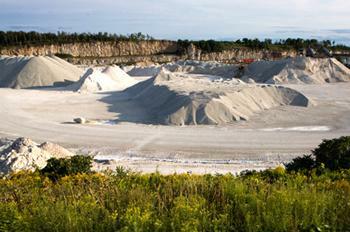 Aggregates quarry is proposed for neighboring Grey County. Appealed to the Ontario Municipal Board last week, it would be directly across the road from the Walker Aggregates quarry. The site is in the center of the Rob Roy Provincially Significant Wetland complex. 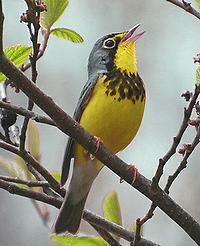 Species potentially impacted include two of special concern, the Canada warbler and the Western chorus frog. Despite close proximity of these two proposed quarries, their opponents say the cumulative effects of the two quarries have not been adequately assessed. As a whole, the escarpment a mosaic of forests, farms, recreation areas, scenic views, cliffs, streams, wetlands, rolling hills, waterfalls, mineral resources, wildlife habitats, historic sites, villages, towns and cities. The escarpment contains more than 300 bird species, 53 mammals, 36 reptiles and amphibians, 90 fish and 100 varieties of special interest plants, including 37 types of wild orchids. Crossed by Canada’s longest footpath, the Bruce Trail, established in 1967, and with some of Ontario’s best skiing, camping, swimming, fishing, boating, hiking and viewing, the Niagara Escarpment contributes an estimated $100 million to local and regional economies through tourism.